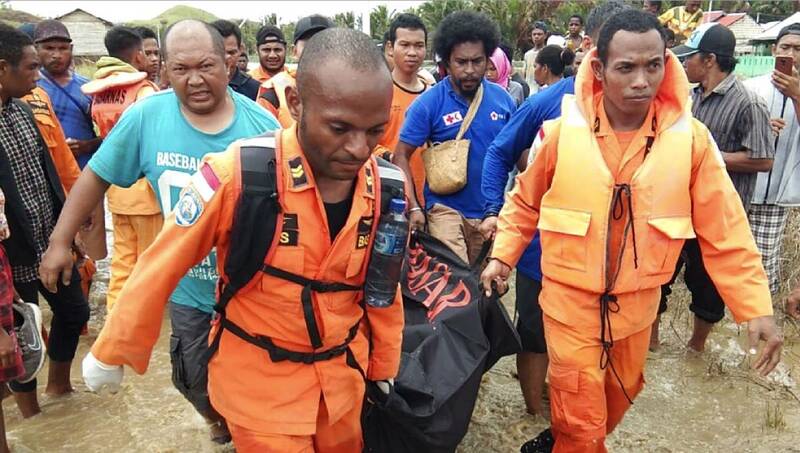 Photo: In this photo provided by National Search and Rescue Agency, or BASARNAS, the agency’s personnel and police carry the body of flood victim at Sentani, Papua Province, Indonesia, Sunday, March 17, 2019. Indonesia, Mar 17 : A disaster official say days of torrential downpours have triggered flash floods and mudslides in mountainside villages in Indonesia’s easternmost province, killing at least 50 people and injuring 59 others. National Disaster Mitigation Agency spokesman Sutopo Purwo Nugroho said the disasters in Papua province’s Jayapura district submerged hundreds of houses in neck-high water and mud. They also destroyed roads and bridges, hampering rescue efforts. He said 50 bodies had been pulled from the mud and wreckage of crumpled homes by Sunday, and another 59 people were hospitalized, many with broken bones. He said the number of dead will likely increase since many affected areas have not been reached. More than 4,000 were people are in temporary shelters.